Deriving an accurate IP portfolio valuation can pose a significant challenge. Transactional insight and clear-cut methodology are hard to come by, and the research required to gather the specific, detailed data is time-consuming and costly at best. 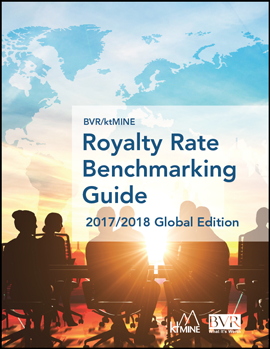 But in the pages of Royalty Rate Benchmarking Guide, 2017-2018 Global Edition, you’ll get a comprehensive, up-to-date look at rates and trends for more than 20 industries. Technology Transfer Tactics is proud to partner with Business Valuation Resources, LLC (BVR) and ktMINE in offering the 2017-2018 Edition of the Royalty Rate Benchmarking Guide. BVR is publisher of newsletters, research studies, directories, and more. Business valuation professionals and turn to BVR for authoritative deal and market data, news and research, training, and expert opinion. ktMINE is an interactive intellectual property database that provides direct access to royalty rates, actual license agreements, and detailed agreement summaries. With precise search functionality and data mining capabilities, ktMINE helps practitioners quickly find and analyze market comparables from over 17,000 IP license agreements with over 65,000 royalty rates.